When I was growing up there was a word my mother will use during our moments of mother daughter talk. She would say, “you must learn to be patient”. I hated the word because I was inpatient. But now I know patience is a virtue and one of my daily request to the Lord is for him to endow me with more patience. Obedience is another one of those words; we read about it but its not one of our favorite words. We all would rather do what we want rather than what God wants us to do. Habits are behaviors that are formed through repetition. We need to study God’s word, form a bible reading habit and learn from the life stories of the patriarchs, prophets and kings who disobeyed God. If we desire God’s shalom to characterise our lives we must be willing to obey his command. 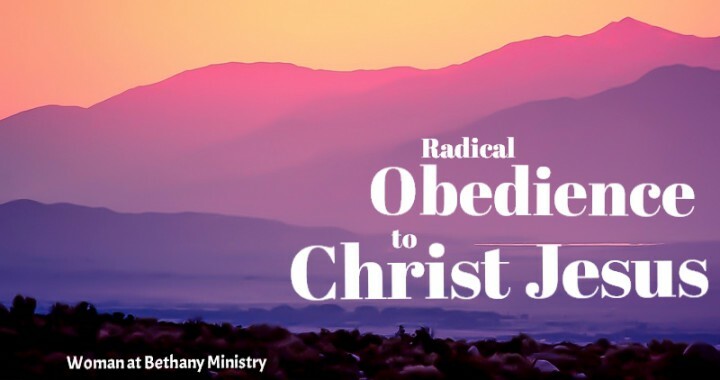 Meditate on God’s word with a desire to ignite a radical spirit of obedience to God. Finding an hour everyday, no matter how busy we are is a good start. This is radical because it’s sailing against the direction of the tide; it is different from what we would do ordinarily. On the Woman at Bethany Prayer Walk, we quickly discover that praying and interceding for hours and confessing the word of God out loud could be a routine habit for an intercessor, but being silent for an hour with eagerness of heart to hear the Father’s voice is radical. Obedience is not doubting God and his promises; it is the path to faith and peace. Disobedience has its roots in doubt and unbelief. Doubt saps energy and confidence out of our lives. Tamar, Rahab and Ruth may have got a lot wrong in their lives, but they got one thing right, trusting God even when they never fully understand, they obeyed God. So even when we doubt we must still obey God, this is the only way to become a woman after God’s heart. In obedience and pursuit of intimacy with Jesus, be determined to form an habit of meditation on God’s word and tune your spiritual ears in quietness to listen to the Father’s voice. Posted in All, Shalom Peace.